The centre of the musical are the incredible performances of the cast: dancers, fire eaters, stilt walkers, acrobats. An absolute must. Oh my my… where do I start? I was not expecting this, not at all. 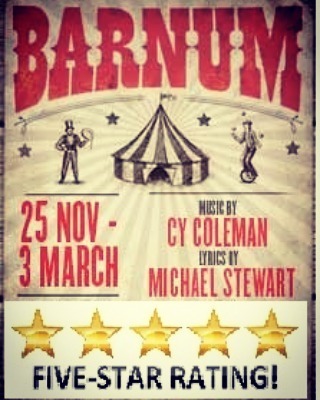 Barnum is the story of the man who created the famous circus and in general the entertainment the way we know it today. But the story is not the centre of the musical (there are no traces about Barnum’s difficult childhood or the difficulties he faced because his attractions were not much appreciated at the beginning). The centre of the musical are the incredible performances of the cast: dancers, fire eaters, stilt walkers, acrobats. There are moments you don’t even know where to look as so many things are happening at the same time on the stage. The songs and the music fit in a classic musical style and they are all very well performed. I probably expected a flat and kind of artificial musical but what I saw it was a naturally and unbelievably spectacular show full of energy, joy, humour and grace for an evening at the lovely Menier Chocolate Factory that I will not easily forget.